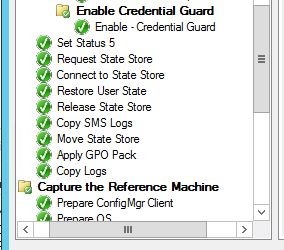 While working with at customer last we it was decided they wanted Credential Guard. Which in it self is a good thing. The problem was that they wanted this enabled as part of the Configuration Manager OSD. Now normally automating things during ConfigMgr OSD isn’t to difficult however ConfigMgr has a problem with things that require double reboots. Since Hyper-V is a prerequisite for Credential Guard and Hyper-V requires a double reboot this poses a problem. This might be solved by Microsoft in the future but for now you will have to employ a bit of a workaround. This consists of a couple of things, one is setting it up so you have a reboot not monitored by the task sequence and the other is installing the required roles and lastly you will also need to input the relevant registry values to enable the features. This is something you should probably do anyway and it is documented in several blogpost before this one. You will need to set a custom task sequence variable called SMSTSPostAction and set that to “Shutdown /r /t 30” this will cause a reboot 30 seconds after sequence thinks its done. Lastly we customize the sequence to run this specific package at specific point in the sequence. The rule here is that it needs to be run after any other steps that can cause a reboot as the script will install and configure everything but the reboot should happen outside of the sequence as we configured it during step 1. So for this customer that happens just before status is set to 5 as you can se in the picture below. The last customization is to set an option on this to check for a task sequence variable. You should check for isUEFI equals true. This is to make this only applied to UEFI based machines as it will not work on legacy bios. If you want to you can add steps to check for Secureboot or other pre reqs. $LogFile = $Logpath + "\" + "$LogName.log"
Write-Output "$ScriptName - SettingsFile: $SettingsFile"
$Arg = "/online /enable-feature /featurename:Microsoft-Hyper-V-Hypervisor /all /LimitAccess /Norestart"
Write-Output "About to run $InstallerName with arguments $Arg"
Write-Output "Finsihed installing Hyper-V-Hypervisor with exitcode $($Result.ExitCode)"
$Arg = "/online /enable-feature /featurename:IsolatedUserMode /LimitAccess /Norestart"
Write-Output "Finsihed installing IsolatedUserMode with exitcode $($Result.ExitCode)"
$Arg = "/online /disable-feature /featurename:Microsoft-Hyper-V-Tools-All /Norestart"
Write-Output "Finsihed removing Hyper-V Tools with exitcode $($Result.ExitCode)"
Windows 10 – Lifecycle change AGAIN!